This professionally produced educational video is a key element of our packet of educational materials for schools in Israel. In the video, teenagers become aware of the plight of homeless cats and decide to help change their world. These educational materials, including the video, will be distributed to schools throughout the country, with the assistance of the Environment Ministry. 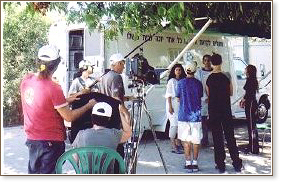 We are grateful to the American School in Kfar Shmariyahu for allowing us to film on the grounds of the school and to its students for being such willing and cooperative "extras." Thanks also to the Israel Guide Dogs for the Blind, which permitted us to videotape on their property, and to Mazzi, short for Mazal (luck), the beautiful cat who lives with Ruti Peles and who is the star of our video. Our educational packet for schools in Israel also includes a colorful newsletter for children about cats and a pamphlet about the benefits of spaying and neutering.